Highest performance. Numerous variants. Full featured. The DIMENSION family unites all the technological achievements PULS has made in the past 35 years. For our customers this means the highest efficiency, longest service life and - of course - the smallest dimensions in the market. We are continously advancing the DIMENSION family with one goal in mind: To give you reliable and efficient power supplies for your applications. Install them in seconds and don't worry about them for years. The DIMENSION family includes the widest range of 12 to 48V DIN rail power supplies. The products are classified in three series: Q , C and X with 1-, 2- or 3-phase input and a power of 80 to 960W. Each series assembles various power supply models. 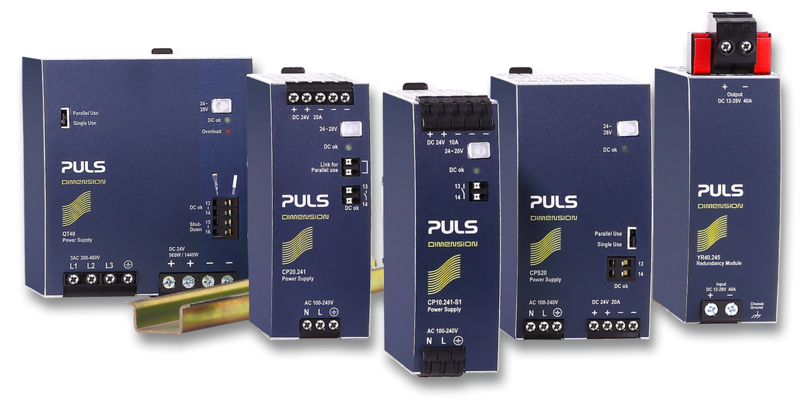 Helpful special features like DC-OK relay contact, remote shut-down, spring clamps or DC wide-range input and important approvals are available for every series. This makes the DIMENSION family valuable for every high demanding application.